File Converter Pro uses a series of temporary folders in the processing of documents. Likewise, the jobs are managed in an SQL database and the Input / Output files are stored in email folders. If a large number of documents are processed in a short period, then can accumulate large amounts of data in the temporary and in the job-folders. Especially when the FCPro server has a high throughput (eg by many CPU cores (16)), then large amounts of data can accumulate in a few days (in the gigabyte range). The disk capacity and configuring in days, how long the data is kept, should be adjusted accordingly. Where the temporary files / jobs are stored? How can you change the default paths and place elsewhere? How can you adjust how long to keep these data? When will the temporary files and jobs deleted? Jobs: C: \ Program Data \ File Converter Pro \ WCF jobs. The path can be configured via the User Interface. 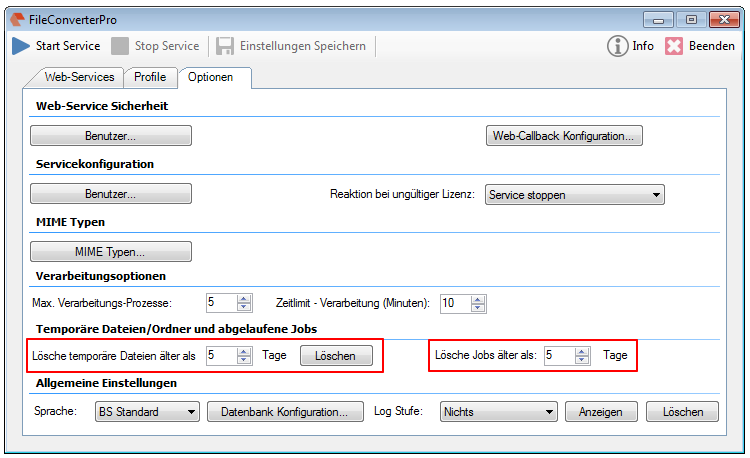 In Jobs folder, a subfolder is created with the job number and stored inside the input file per job. The PDF generated target file is stored in the job folder “Out”. The Jobs folders are automatically deleted after a set number of days. The status is set in the job database to “Expired”. 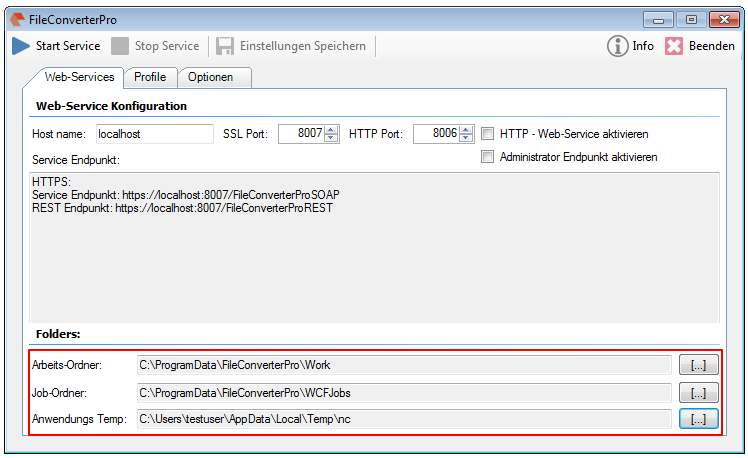 Working folder: C: \ Program Data \ File Converter Pro \ Work. The path can be configured via the User Interface. The files in it are automatically deleted after a set number of days. NET Common Folder: Temporary folder -% TEMP% / nc. 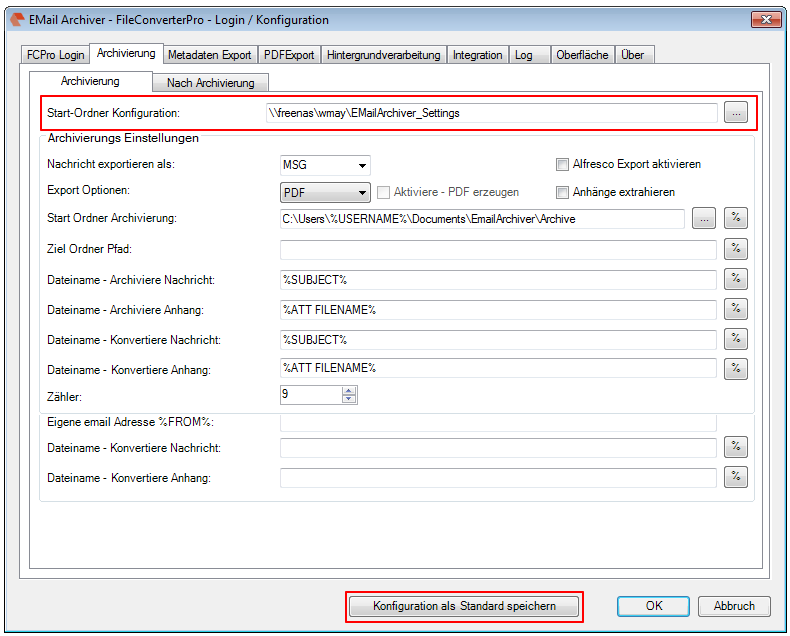 The path can be configured via the User Interface, and PDFnet folder -% TEMP% / pdfnet. These two folders are only not deleted when the application is not properly (eg exits via the task manager or crashes). The folders are temporarily used to copy files, move, rename, and for PDF / A conversion. The files are first created in these folders and processed and moved to the destination folder only at the end. Normally, if the service is started and stopped in the normal way, this folder should contain no files. If still files left over, they will be automatically deleted after a set number of days. Abbyy Temp folder: Temporary folder for OCR processing. % TEMP% \ ABBYY FineReader Engine 10 – The path can be adjusted using the Abbyy OCR configuration. The files are automatically deleted after a set number of days. Because PDFs can contain text already and therefore not all the documents / pages to be subjected to OCR processing, we have implemented the intelligent OCR processing. Previously, this feature was only for PDF output. 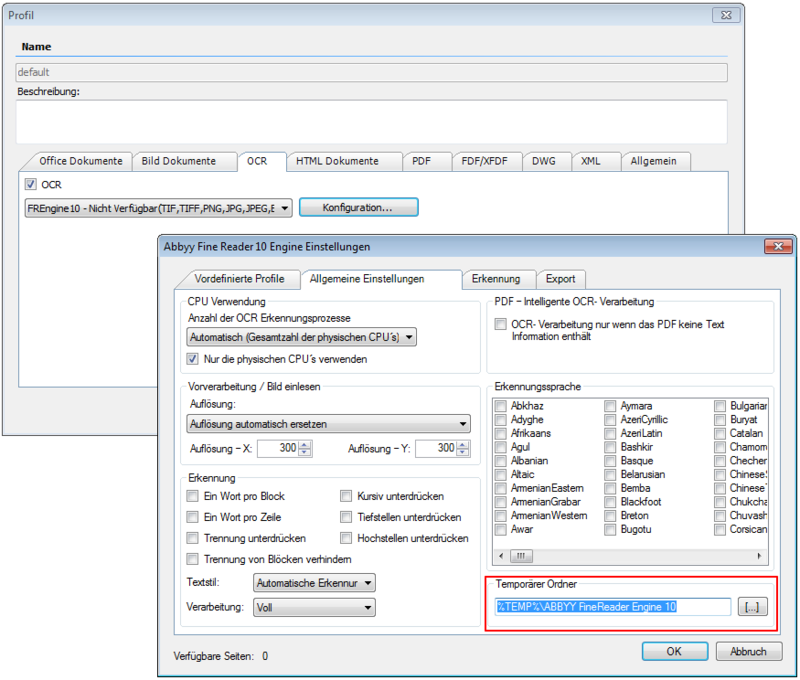 The Alfresco integration AutoOCR can also be configured for plain text output. Here AutoOCR generates only the text required for the Alfresco full-text search. With the AutoOCR 1.10.17 now the intelligent OCR processing is not only for the PDF, but also for plain text output. So it will be OCR processed only PDF image files. For normal PDF’s the text is extracted directly without OCR processing. This saves time and resources. For the Abbyy OCR Engine Version 10 Demo licenses are available for 30 days or 500 pages – these can be requested from us. File Converter Pro (FCPro) – Which version of MS Office? – 32 or 64 bit? There are now a number of different Microsoft operating systems and various MS Office versions. Which combinations and versions can be used for the FileConverterPro for conversion to PDF or PDF / A? What is recommended? FC Pro is a 64bit application and can therefore only be installed on 64-bit operating systems – Thus, MS-Windows 7, 8, 8.1, 10 and MS-Server2008R2 and MS Server2012 be used. FC Pro can convert MS Office documents without MS Office (= “directly”) or with the help of installed MS Office software, to PDF or PDF / A. Almost always FC Pro is installed as a server application, say FC Pro PC is only for the conversion and is used for no other tasks. On clients you install nowadays, for compatibility reasons, usually a 32bit version of MS Office. Supports currently: The 32 and the 64-bit version of MS Office 2010, 2013. For the FileConverterPro we recommend in any case to install a 64bit version of Office. Please note that on Windows Server 2012 32bit version of MS Word 2013 is not supported. Here can be used for technical reasons, only the 64-bit version of MS-Word 2013 or the “direct” conversion.